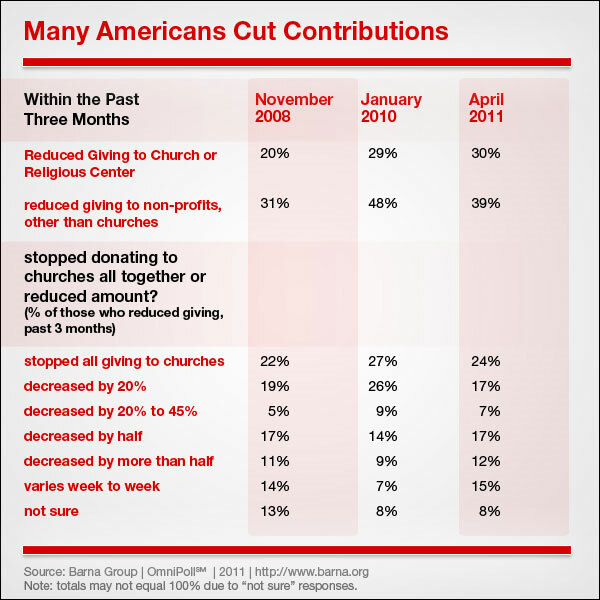 The Barna Group just released some new statistics on tithing and donations for 2007. – here. Interestingly enough George Barna takes a stand against tithing as a legitimate practice in the New Testament Church. This is all kind of exciting to me, because i’m in the middle of reading the book, “Pagan Christianity” by Frank Viola and George Barna. I am about two-thirds of the way through and i can’t seem to put the book down. I will write a post about that when i’m finished it, but i just mentioned it because i had just finished up the chapter on “tithing”. Ironic. . . i guess. I would like to point out that greed is not biased to non-tithers. I’ve heard many a times that Tithing is an antidote for greed. 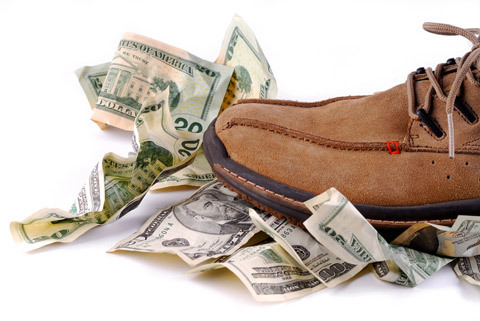 The reason why tithing does not over come greed is because tithing is not the master of greed. A pure heart, that is undefiled and led by the Spirit of God is the master of greed. Tithing has no power over sin, but the Spirit does. This is confirmed because although Israel had tithing completely spelled out for them, they still had to overcome their greedy hearts. Also regardless of whether our giving is plainly spelled out for us through tithing or is an unpredictable factor through spirit-led giving, we still have to listen and obey. In other words, just because how much we should give is written in black and white compared to Spirit led giving, which is not; we still have to put down our selfishness and obey one or the other. Many people are blinded to the point where they view tithing as a “principle” not a “practice”. George Barna said it right, “tithing is a Jewish practice, not a Christian principle”. There are 2 practices that come to mind when thinking about the Church. One, Baptism, and Two, the Lord’s Supper. Tithing is not one of them, nor is it a principle. I’ve said this so many times- tithing is a standard, not a principle. In the old testament we see Abraham as the first person recorded to tithe. But we are not commanded to follow Abraham’s actions, we are commanded to follow his faith. Barna also mentions the 3 functions of the tithe. Support the Levites, fund Jewish religious festivals, and to help the poor. At this point i see the Church doing a good job of fulfilling one out of three of those tasks. That’s if you want to equate support of the levites with support of those who are ministering. If we were busy trying to build God’s kingdom instead of our own kingdom, i think we would be doing a much better job with fulfilling the other functions of the tithe (not that i want the tithe and all it’s purposes incorporated into the Church). Just hypothetically speaking. During the first five years of the decade, an average of 84 cents out of every dollar donated by born again adults went to churches. In the past three years, though, the proportion has declined to just 76 cents out of every donated dollar. That was a part of Barna’s interpretation of what the statistics are telling him. And i agree. What’s your thoughts on the new tithing statistics and trends? Do you think Barna is on target with his analysis? Do you think this blog is on target? Just want to ask you a question, Are you a Jew? Are you a Jehovah witness? Are you a Seventh Day Adventist? if not then stop behaving like them you need to get down on your knees my friend and do some prating cause your intelligence is futile, Since when have any of us followers of Our Lord Jesus Christ said anything against Giving??????? ?You tell me cause you’re really annoying now and showing your true colours, We hate Tithing in the way that people like you promote, It’s all lies and dead works, wake up Dean cause you’re not listening again. Who are you to judge us???? Greedy lil man, You need to deflate…….. The three amigos, Jimmy, joely and sammy. can you guys act individually or do guys always have to be pack hounds? Holy Smokes you guys act like circus clowns (and for our next act). 2Cr 8:12 For if the willingness is there, the gift is acceptable according to what one has, not according to what he does not have. Did you guys get that? You are responsible to give according to what you have!!! That means depending on what you get, you give. I don’t care how you slice it. That is a type of tithe( I don’t care what you call it, the same principles apply). You guys make jokes about giving animals and grain offering but do you realize that Christian brothers in Africa and other 3rd world countries still give that to the Lord as offering their first fruits (the best) of what they have? They don’t have Money to give but they give from what they have! you don’t know that because you probably don’t do mission work either. You guys probably spend most of your time in your rooms playing play station or x-box. Godly giving will never be abolished, so stop trying. You are so caught up with this tithing money to get, you miss the reason why God saved you. Take a deep breath and let go, God loves us unconditionallly even if we are not “BIG GIVERS” like you and your tithing friends. Sow your finances,time and all you give but please do not blow that horn that you like to blow so much. You do not have to impress anyone if you are really giving it to God. God knows your heart and the motives why you give. Do not compare your giving with anyone it shows how immature you really are. Try to relax we are just debating here, the sun will rise up tommorrow again whether you pray for it or not.We do not have to pay for Gods peace and rest its free. Try receiving money from God first then you can share it with as many people as possible. Gods blessings are free not earned. Call it what you want, we all have a responsibility to consistently give of what we have. How about if you guys just call it responsible giving? can you handle that? 1Cr 9:9 For it is written in the Law of Moses: “Do not muzzle an ox while it is treading out the grain.” [fn] Is it about oxen that God is concerned? 1Cr 9:10 Surely he says this for us, doesn’t he? Yes, this was written for us, because when the plowman plows and the thresher threshes, they ought to do so in the hope of sharing in the harvest. 1Cr 9:11 If we have sown spiritual seed among you, is it too much if we reap a material harvest from you? 1Cr 9:12 If others have this right of support from you, shouldn’t we have it all the more? But we did not use this right. On the contrary, we put up with anything rather than hinder the gospel of Christ. 1Cr 9:13 Don’t you know that those who work in the temple get their food from the temple, and those who serve at the altar share in what is offered on the altar? 1Cr 9:14 In the same way, the Lord has commanded that those who preach the gospel should receive their living from the gospel. That really hurt sammy. Should I tell my mommy? It’s Mr Sam to you son, Honestly Billy you’re a real try hard…I wouldn’t mind betting that when you were out in the world and lost you were a nobody,now you come into the Church and try to be someone and something…God has no favourites Billy boy. My intentions are not to hurt you but I guess like a brother trying to steer you away from danger, however because of your block head it’s proving to be very hard, yeah maybe tell mummy to nurture you a little more…the solids are causing you to choke way too much buddy boy. Kerio Elesion. Jesus never commanded New Testament believers to adhere to the Ceremonial Law of tithing, as New Testament ‘tithing’ cannot rescue fallen humankind from their desperate position under the curse of the Law, (Gal. chapters 2 & 3.) In the same way Jesus never commanded that animals must be sacrificed to atone for sin, as believers of the New Covenant live under an entirely different dispensation from that of the Old Testament Israelites. If the clergy chooses to keep one law, (tithing,) to ‘earn’ blessing from God, they must keep the entire Ceremonial or Ritual Law, and thereby proclaim that they do not need the Lord Jesus and His complete atonement. They then actually reject the grace of God in Christ – Gal. 3:10-14; Gal. 2:21. God certainly does not expect us to pay the taxes of Old Israel as well! 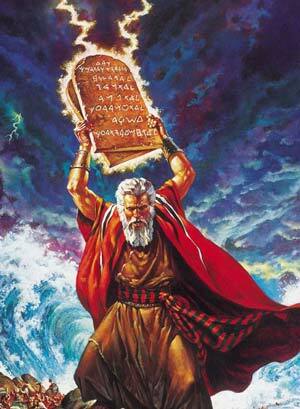 I guess since no one is in observance of any laws, lets just steal and kill and spiral into idolatry. You are so far off that you are missing something very important. We are not to break the laws of God (we are not under the Law, this is true) now that we are under the dispensation of grace. Jesus said:Mat 5:17 “Do not think that I have come to abolish the Law or the Prophets; I have not come to abolish them but to fulfill them. Mat 5:18 I tell you the truth, until heaven and earth disappear, not the smallest letter, not the least stroke of a pen, will by any means disappear from the Law until everything is accomplished. Mat 5:19 Anyone who breaks one of the least of these commandments and teaches others to do the same will be called least in the kingdom of heaven, but whoever practices and teaches these commands will be called great in the kingdom of heaven. Jesus did not teach this one day and then in just a short time at Calvary fulfill the Laws so people could disregard them. Billy,The Mosaic laws demands the Jews to kill people who are caught in adultry or break the sabbath, kill rebellious teenagers,sin offerings,burnt offerings with blood of animals. Do you understand that or not. And eye for an eye. No gentiles allowed near the santuary of the Lord. Paul used to kill christians because he was practising the law. This is what I said before, you have no idea what you are talking about here. Cold hard law includes killing those who violate it or we sin against God. Do you understand that at all, I dont think you ever get it. The law demanded the Jews to kill anyone that breaks the law whether a child or wife, husband it does not matter. You need to start from learning your A B C because now I know you are absolutely wasting my time. Sorry little Joely, I don’t mean to hurt your feelings. Obviously we have struck a nerve. You have no clue to what your talking about, NONE. I never said that we are under the Law, you show me one blog where I said we are under the Law. You are so far off and now you are accusing me (which by the way is a characteristic of the Devil) of something I never said. Are you struggling with Comprehension issues? You always just want to attack, maybe this blog is not good for you. Be blessed and trust in Jesus!!! The law of the prophets says to kill those who commit adultry, break the sabbath ..etc thats what Paul did before he met Jesus on the road to Damascus. This is the same law you are talking about here, civil, ceremonial,judicial law given by Moses CAN NOT SEPARATED BY ANYONE. We are not allowed to change one little part of it. If you keep the law of tithing you need to keep the rest or you are guilty of the whole lot Galatian 3:10 .The New Covenant and Old Covenant DO NOT MIX. You can not MIX THE BLOOD OF JESUS WITH THE BLOOD OF ANIMALS. Unless you are so thick and stupid or uniformed like you.Its insulting to christians who love Christ. We will have another class later. Bring your note pads and a pen. Make sure you guys raise your hands so there is no disruption. There will be a snack time waiting if you will just try to be good! Mic 6:8 He has showed you, O man, what is good. And what does the Lord require of you? To act justly and to love mercy and to walk humbly with your God. Should we disregard this too? it is in the old testament. There are certain things that were taught in the new testament and early church to disregard. physical circumcision and food. We are called to be circumscribed of the heart and the eating of certain foods that were not allowed in the old testament like pork and shell fish (just as some examples) are no longer forbidden. I do not read anywhere in the new testament where Jesus or any of the new testament writers say that we should disregard tithing like I don’t see anywhere in the new testament where we should not observe and still obey the 10 commandments. Grace is by no means a replacement for obedience. I am glad that we can agree to disagree. In the Lord I Love all you brothers and I pray Gods best for each of you!!! Look in the Book of Hebrews chapter 7 & chapter 8 as John said, you’re behaviour is out of control? I think you have dug a pit and fallen in my friend.. It must be so dark down there, do you want a torch Billy caused we have been offering it to you many times and you won’t accept, I think John had put it to you correctly and surely you cannot fault what he has said, bless you Billy love Sam,Joel,James and now John. You and Johnny have missed the point of Hebrews 7 & 8. “Because of this oath, Jesus has become the guarantee of a better covenant” (v. 22). Here the word covenant is used for the first time in this letter, almost casually. It will be picked up again in the next three chapters for more detailed comment, but even here it is implied to be a replacement for the inferior, ineffective law of Moses. The discussion is not just about a minor priestly regulation but a covenant, which includes many laws. The author then contrasts the mortality of the Levitical priests with the immortality of Jesus Christ: “Now there have been many of those priests, since death prevented them from continuing in office; but because Jesus lives forever, he has a permanent priesthood” (vs. 23-24). So the fact that there were many Levitical priests is actually an illustration of their weakness, not of their effectiveness. The genealogy that validated them also testified to the weakness of the entire system. Each high priest held office only temporarily, and the entire priesthood itself was temporary. In contrast, because Jesus lives forever, he will forever continue to be our High Priest, because his priesthood is effective in bringing us to perfection: “Therefore he is able to save completely those who come to God through him, because he always lives to intercede for them” (v. 25). “Such a high priest meets our need,” the author says (v. 26). Jesus is exactly what we need. He was human, so he knows our needs (2:14-18), and he is now in heaven, in power, so he can effectively intercede for us. We can therefore be confident that we can approach God through him (4:14-16). He gives us access to God in a way that the Levitical priests could only symbolize. This is not supporting your misconception about giving. You guys miss why this was written, all because you see the word tithe. Like I said, you guys are the Minority in your doctrine of not giving. Don’t start misquoting scripture like narrow is the way that leads to salvation. If you are Born again and Jesus is your Savior( like He is mine), I am sure your saved and going to heaven. What you give is between you and God. Why you give is between you and God. Bless you guys, hope you don’t mind me having fun with you guys. Be blessed as you surrender to Him(JESUS) and allow him to use your life!! !